We are the lords of this Long Night, leading our flocks in the ways of the blood. 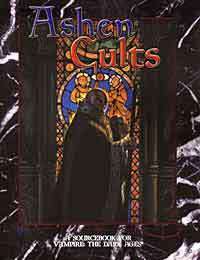 They gather round our altars and in our churches, they form covens and cults in our honor. They are our worshippers, our slaves and our stock. And we are their gods. Ashen Cults is a complete guide to the dark faiths promoted by Cainites in the Dark Ages to promote their agendas, rule their domains and seek their own enlightenment. From ghoul and revenant blood cults and twisted Ventrue breeding stock to secret Malkavian orders and black churches, everything you need to add strange servitors and fanatical devotion to your chronicle is right here.